March | 2013 | Om nom nom! Tarts are one of my favorite desserts, and I love this one from Southern Living a few years ago. I’ve used it for a couple of Spring get-togethers in the past, and it’s been nice and refreshing every time. 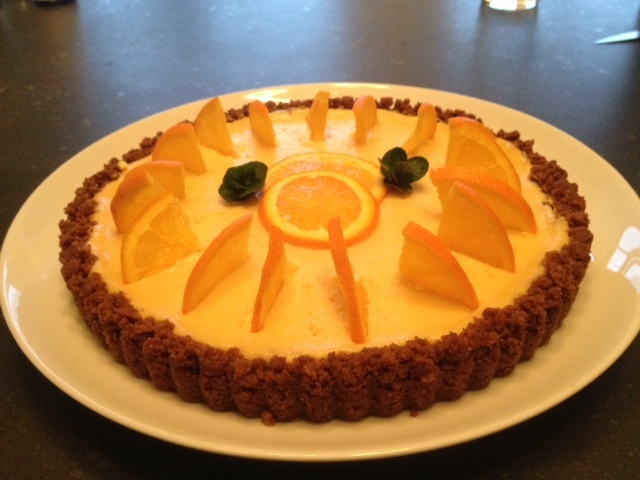 What attracted me to it originally was the ginger snap crust with the orange – it seemed like a winner. My only complaint about this recipe is that I usually find I need more crumbs/butter to make the crust than written, but I find that with almost all crumb crusts so clearly it’s me. Regardless, if you like a thicker crust, plan to 1.5x the crust recipe and you’ll be good to go! We really enjoyed this for our Easter dessert with some homemade whipped cream. We went with these as a side for our Easter dinner, and we really liked them. They were very flaky and had lots of flavor. I added a handful of finely sliced green onions and about 1/2 a teaspoon of garlic powder. I think next time I will double that, and also cut the salt in half – our only complaint was that they were a bit on the salty side. The recipe below is as-written. I did do an egg wash on the top of them, and though it was optional in the recipe I think it shouldn’t be skipped. 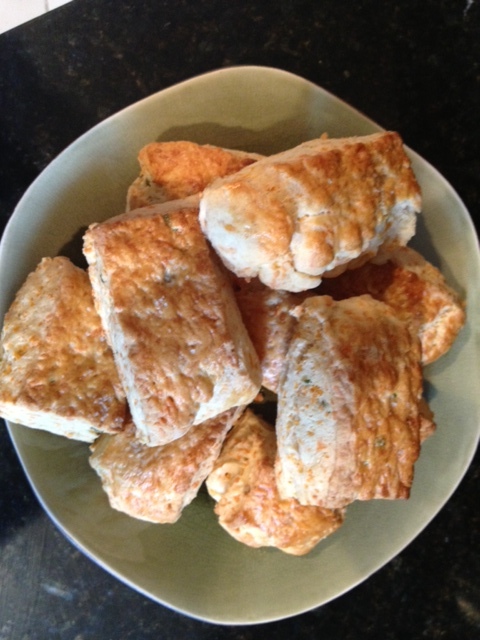 This is another Ina Garten recipe, and a definite go-to for biscuits. Besides brunch, I always associate Hollandaise with Easter meals. This is an Ina Garten recipe and has been a no-fail recipe for me, and is also super easy. 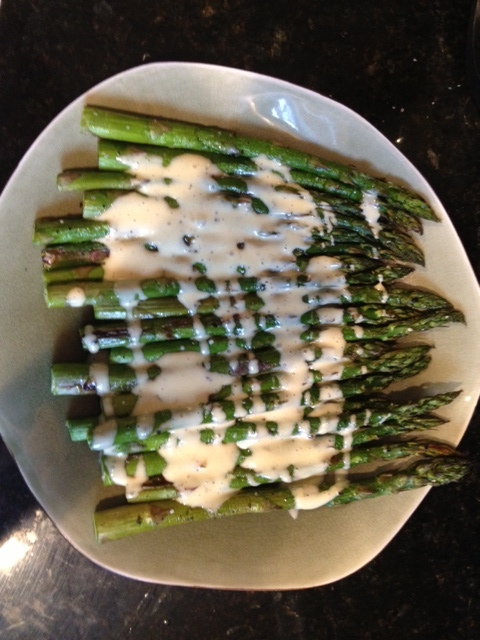 It was delicious over some roasted asparagus for our Easter dinner. Weirdly enough, I’ve never steamed fish before. I saw this when I was perusing Chow at the beginning of MMM, and thought I’d give it a go. It was excellent! Great flavor, even though I altered the recipe given I was lacking in some ingredients (or accidentally used them in other recipes *cough*). I was missing the preserved lemons for this, but a shot of lemon juice into the simmering liquid was fine…next time I would like to try the real thing, however. This is a definite make again, and would be fine with any mild white fish; I used Mahi. 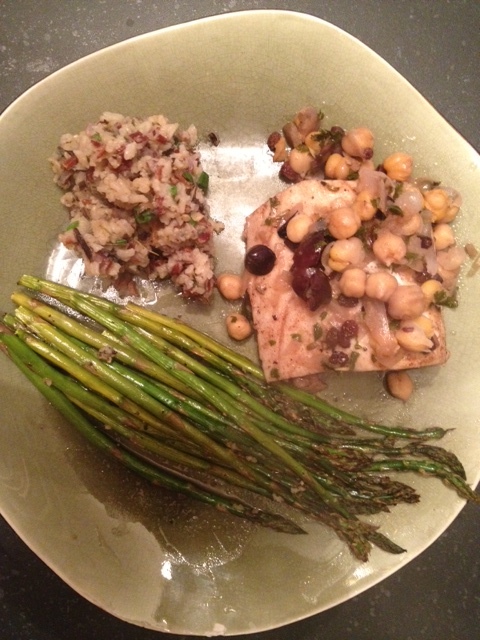 I served this with herbed brown rice and roasted asparagus. Recipe below is unaltered. Quick weeknight meal that uses up some veggies in the fridge. 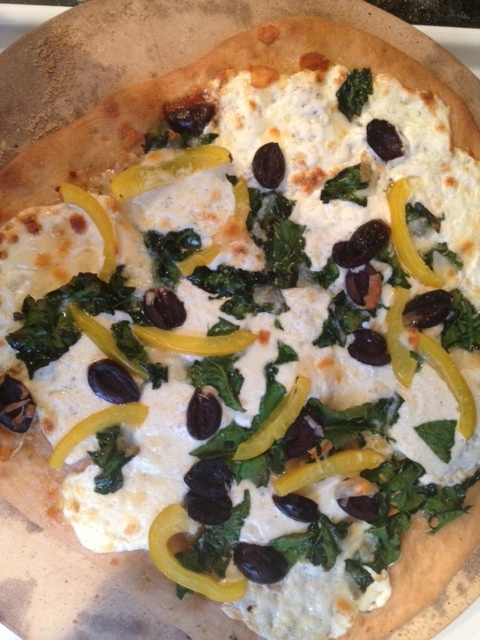 The combination of the spinach with the yellow pepper and kalamata olives was awesome. We used our tried and true Mark Bittman Whole Wheat Pizza Dough, though we did actually use all white whole wheat flour (I was out of all-purpose) with good results. The groundhog was seriously wrong and Spring did not come early. In fact, it’s rather late…it’s snowing right now, no lie. We were thinking today that comfort food would go well with this disappointing weather, and given it is MMM, Mac and Cheese was the first thing that came to mind. Definitely a splurge meal, but we enjoyed it. 🙂 I used a Cooking Light recipe and tweaked it a bit – we will definitely do this again. 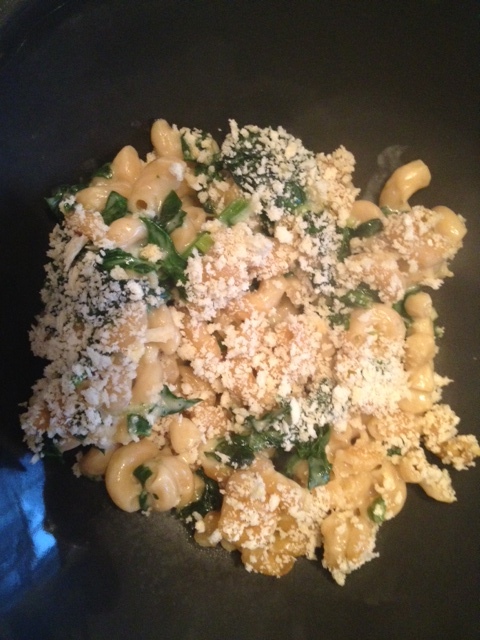 Recipe below is with my adjustments/additions. On the advice of my friend Missy, we gave this a shot for MMM. I don’t know where it has been all our lives, because it’s awesome. Despite the fact that we have the Momofuku cookbook and never saw this, I’m glad it has been pointed out now! You can do anything with this base sauce and noodles. We did broccoli and green peas. Would have been great with an egg too, and many non-veggie possibilities as well. Definitely a favorite of mine now! 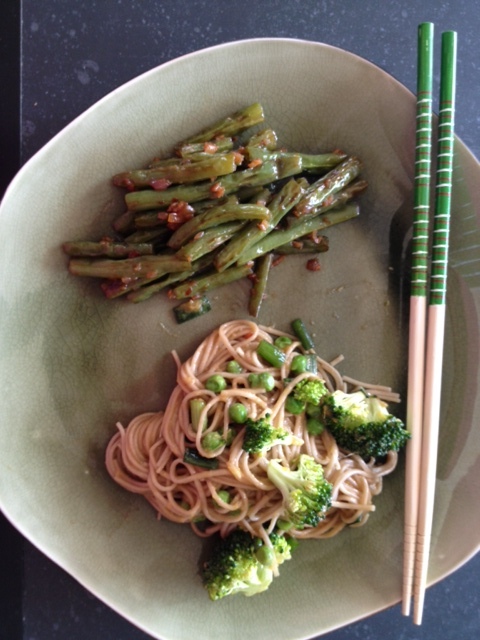 I served this with Sichuan Green Beans.